Do your kids like to decorate treats? I can’t think of any kids who don’t! 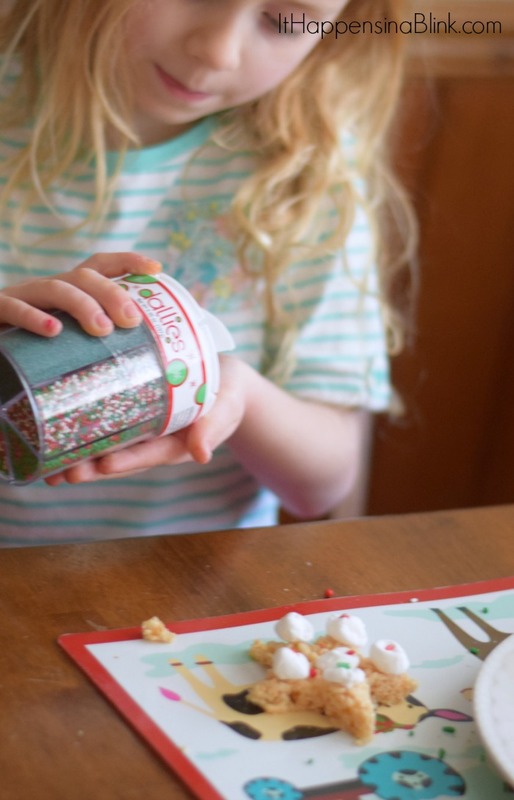 If you’re attending a holiday party this year and need a fun activity to keep the kids occupied, check out this Krispie Treat Decorating Activity for the Kids’ Holiday Table. There’s also a chance to win a goodie box with everything that you need to get started! 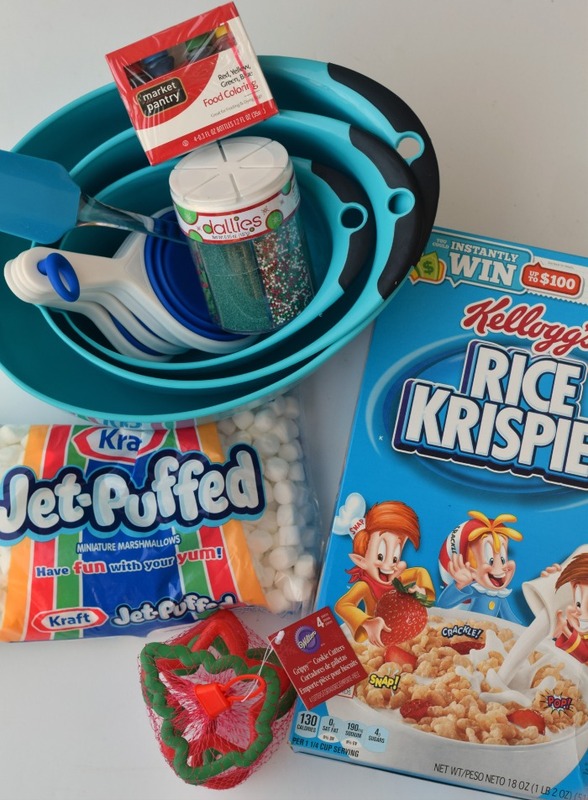 A special thank you to Rice Krispies’ for sponsoring today’s post and the giveaway! One of my kids’ most favorite things about the Christmas season is going to new places to play. They like going to visit family and friends that we do not get to see much and playing with everything in sight. This always works well when we go to other houses that have kids. The downside is when we go somewhere that’s not accustomed to having kids in their home. My boys will find something- anything- to play with, and that’s not always a good thing! Taking activities for the kids to do is something that I try to do when I can. Do you do this for parties? 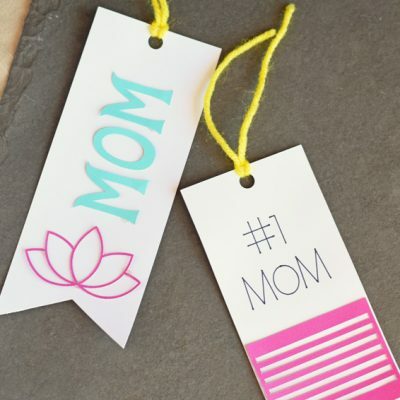 It can be a great idea, especially if you get together with a few other moms and you each plan to bring an activity for the kids. 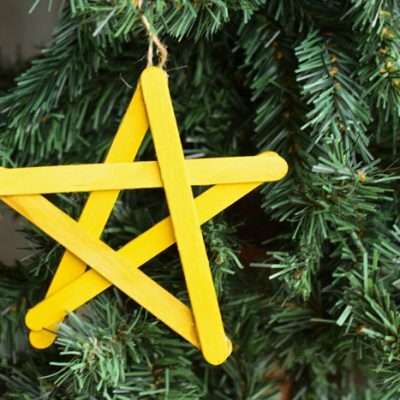 A little planning ahead can prevent too much holiday party boredom, which often leads to the breaking of other’s household treasures (yes, the triplets have been known to break a knick-knack or two in their time). 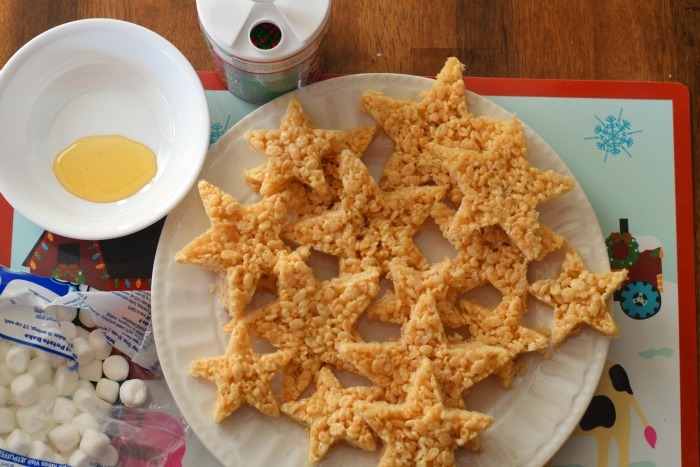 Most kids like to decorate cookies and treats during the holidays, and one of the simplest ways to do this is with a big batch of Rice Krispie treats! This requires minimal prep work for the adult. 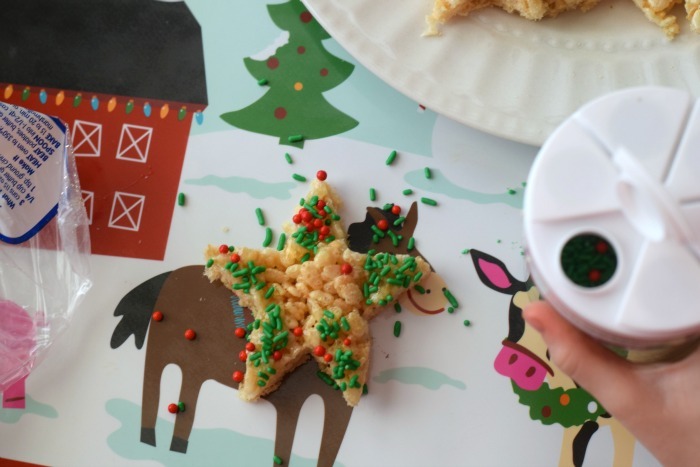 Make a big batch of Rice Krispie treats, pick up a few decorating supplies at the store, and then let the kids decorate them! 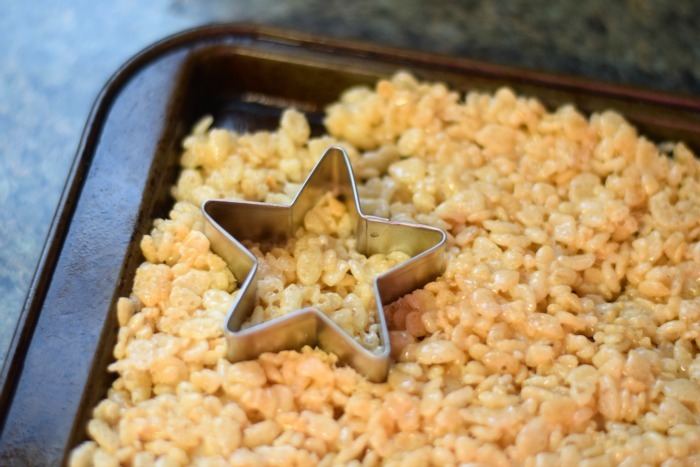 I won’t bore you with the recipe for Rice Krispie treats. If you’re like me, the general recipe is probably ingrained in your head. If you need a refresher, you can find it over on the Rice Krispie treats recipe page. 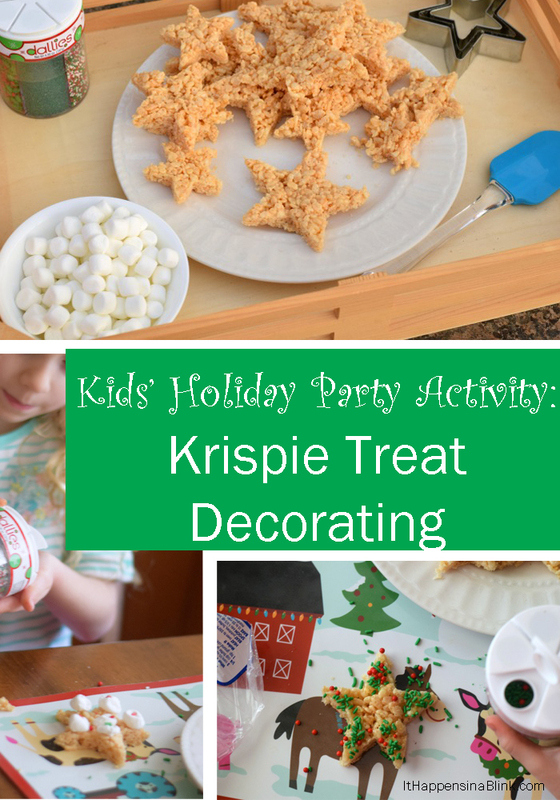 Here are a few tips for making your Krispie Treat Decorating Activity for the Kids’ Holiday Table seamless and fun! 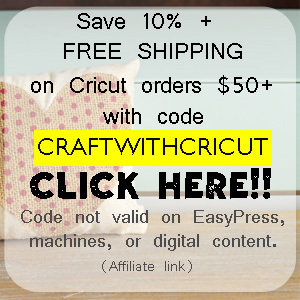 Take lots of decorating goodies! Candies, marshmallows, and sprinkles are always fun additions. Don’t forget something “sticky” to allow the candies and sprinkles to adhere to the treats. Frosting is the most common to use, but I’ve also used honey in a pinch when I was out of frosting and didn’t have time to make any from scratch. If possible, make the big batch of treats on the same day as the party. This will guarantee that they are yummy and fresh! When planning for smaller kids, go ahead and cut out the shapes for them. 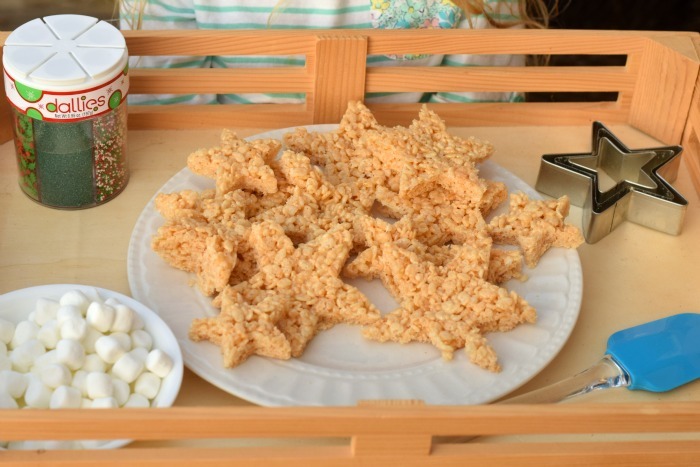 For older kids, just take the covered pan of treats to the party and let them cut them out themselves! Want to go an extra step? Christmas placemats or personalized placemats are great to cover the workspace, allow for a personal work space for each kid, and make a nice party favor to take home afterwards! The treats can double as dessert. 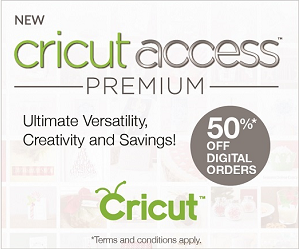 Hello time-saver! 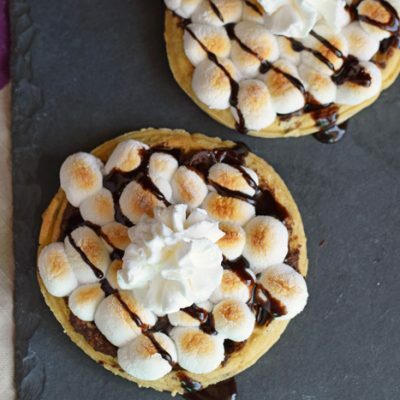 When the kiddos are finished, snap photos of their awesome creations for a good cause! For every Rice Krispie treat shared on social media through January 1, 2016, using the hashtag #Treats4Toys , Kellogg’s will donate a gift to Toys for Tots for a child in need! 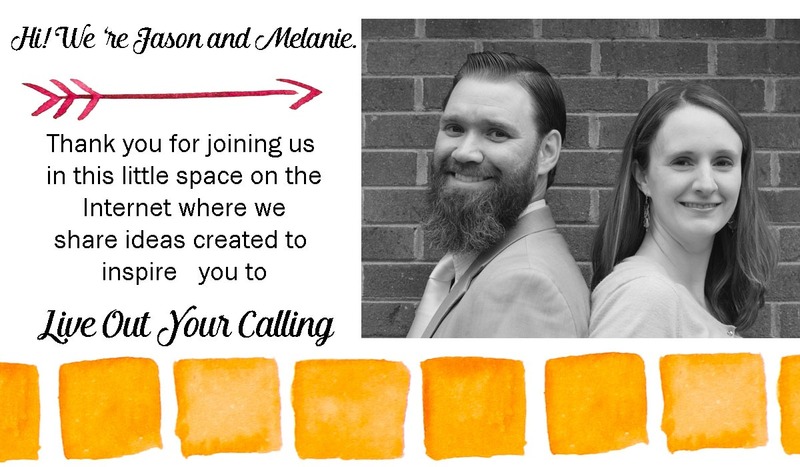 See more info, as well as what others are sharing, on their website! Disclosure: Void where prohibited. For full rules regarding prize fulfillment and eligibility, please see the Official Rules. Open only to residents of the US. ItHappensinaBlink.com is not responsible for prize fulfillment. One winner will be randomly selected using the Rafflecopter random selector and notified via email. Once notified, the winner will have 48 hours to respond or a new winner will be chosen. This giveaway is in no way associated with Facebook, Twitter, Instagram, Pinterest or Google. Giveaway ends at midnight 12/7/15. I like to donate toys to my church. Yum! I love Rice Krispie Treats! We like to help out by donating to our local food bank this time of year! One thing we have done with our kids the last few years is buying presents for the giving tree. Our kids like to do it and it seems to give them a perspective on how fortunate they are. This is a cute idea! We like to give back by doing projects like the Angel tree and making treat bags for our neighbors. We donate coats, food and toys. We always donate toys for those in need! We like to give toys for the local toy convoy and food to our church’s food pantry. /We like to volunteer during the holidays. I volunteer at the kids school for a Christmas food and clothing drive. I like to bake treats for others. We love to leave treats/ presents anonymously. I do my best to pay it forward all year, but esp at Christmas. During the year I crochet scarves for our church to pass out to the homesless. We love baking treats this time of year! The kids love the making and the eating. This looks like a fun giveaway! Thanks for the chance.